Try this yummy, refreshing and healthy salad when produce is at its’ peak during the summer. It’s a snap to put together, and stores well for a few hours, or is delicious served right away. The only special tool you need is a good sharp peeler. I prefer a Y style peeler, and I think Rösli is the best brand, it stays sharp. 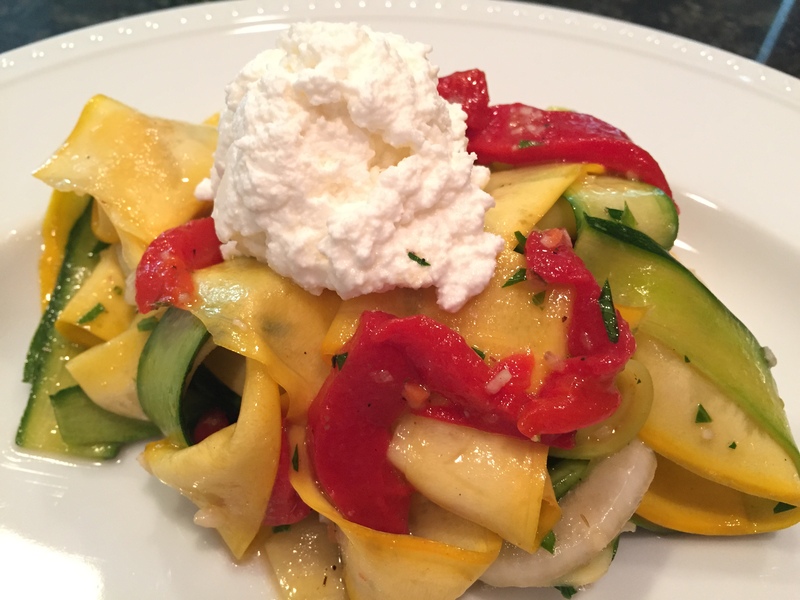 I love zucchini this way. It has such a different flavor than when cooked. 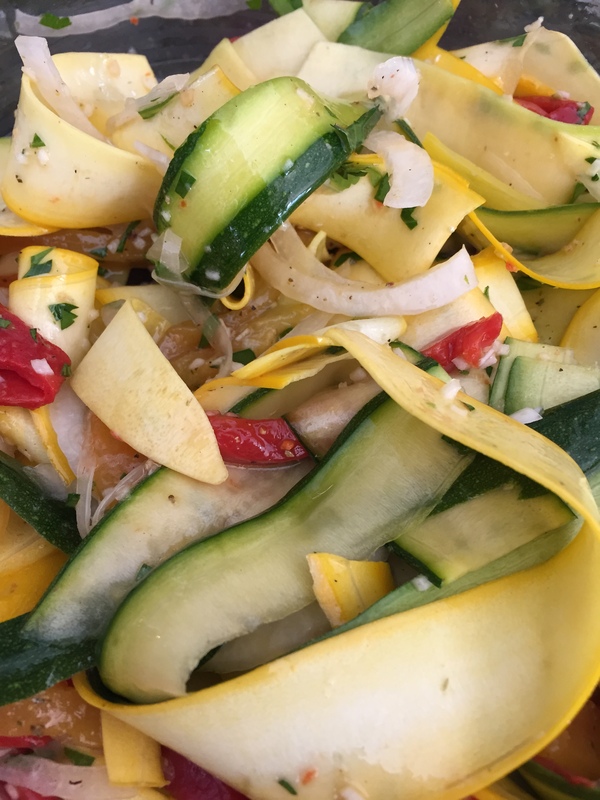 If you don’t think you care for squash, try this recipe, you just might change your mind! This serving size is for a generous 2, so double it for more servings. 1. Cut the top and bottom off the squat. Using your vegetable peeler, ‘peel’ it into ribbons working from top to bottom. I peel down just to the seed core, then rotate it 90 degrees and slice the next side, working your way around the vegetable. Toss the core. 2. Cut your whole onion in half, then in half again. Lay on its cut side and holding one of the root ends, slice into thin quarter rings. 3. Whisk the olive oil into the lemon juice, add the garlic and seasoning. 4. Toss all the ingredients together. 5. If desired, top with a dollop of ricotta, fresh as possible. Tip: If storing for longer than a 1/2 hour, do not salt it until serving. Squash has a lot of water. Salt will pull that water out and your salad dressing will be diluted and weak tasting. This is one of those dishes where there are very few ingredients, as such, buy the highest quality produce you can find. And if your store doesn’t carry fresh Ricotta, any decent Italian Deli will carry it. Summer in Minnesota is short, so I don’t like to dawdle in the kitchen. Toss this together, pair it with a protein and head outside for a picnic! Grab your cowboy boots and hat, and sidle up to this nummy salad! Trust me, you’ll be looking for a steel guitar and pining for the smell of horses and leather to accompany this scrumptious and versatile salad. I put ‘salad’ in quotation marks because leftovers are absolutely delicious over the top of grilled french bread -‘Hello Paris!’ , as a ‘Bruschetta’ topping – or is it ‘Ciao Italy’?, or as a chunky dip with sturdy tortilla chips -‘Hola Mexico!’. I’ve served this in organic romaine lettuce or butter lettuce leaves, which is like a vegetarian version of a the Asian lettuce wrap, and it would be a nice punch of flavor in a breakfast tortilla wrap with scrambled eggs. It is so versatile for leftovers, but so delicious, you may not have any ‘left over’!!! 1 can (approx 2 cup if you make your own) Black Beans, rinsed. 2 cups corn. I used leftover corn cut from the cob, from a previous nights dinner, but you can use defrosted frozen. Cilantro: A nice big handful, chopped. We love cilantro, so add a bit more, and I will add some fresh to leftovers. Avocado: I slice this over the top of the salad. You can rough chop it and toss in to what you are going to eat, but it gets mushy if kept too long. Better to add it fresh to the portion you are eating. Toss the beans, corn and cilantro with the dressing. Top with fresh ripened avocados. While I seem to have covered the globe in serving options, I will personally start with what is closest to my heart. Cowboy country flavored good eats!! Yee Haw!